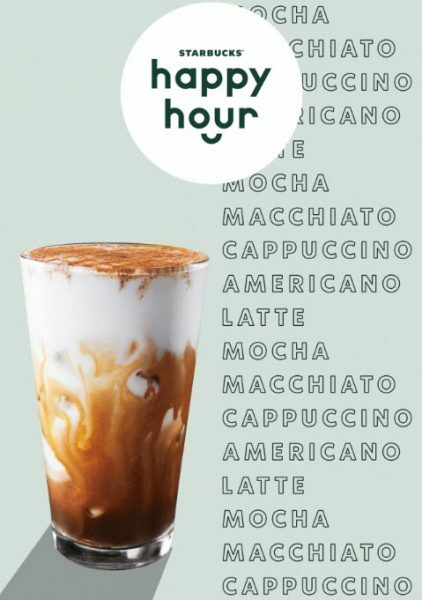 Save 50% off any handcrafted espresso beverage, size grande or larger during Happy Hour on Thursday, March 21, 2019 from 3pm–close (in your time zone). Offer valid 3/21/19 only after 3 p.m. at participating Starbucks® stores in Canada. Offer excludes hot and iced brewed coffee, ready-to-drink beverages, Starbucks Reserve® beverages and Frappuccino® blended beverages. Cannot be combined with any other offer or discount. Offer valid for one-time use.